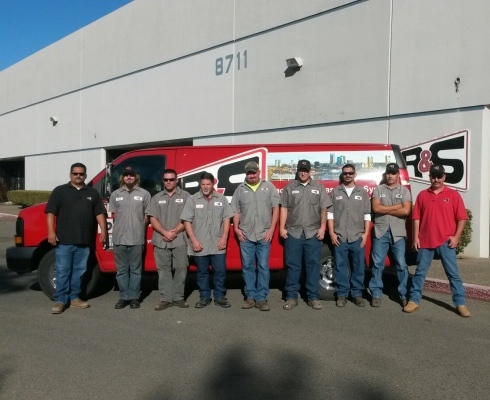 R&S Overhead Doors and Gates of Sacramento, Inc.
We install & repair – Steel Rolling Doors, Commercial & Residential Sectionals, Operable Walls & Partitions, Custom Gates, Fencing, Hollow Metal Doors, Storefronts and so much more it can’t all be listed here – please our complete product & service list. Besides our own line of R&S Advantage doors we offer doors from two other industry leaders, Wayne Dalton and Clopay. Premium-duty 20 gauge and heavy-duty 24 gauge steel non-insulated commercial garage doors offer long lasting dependability and enduring quality that will meet the rigors of daily use. 25 gauge non-insulated steel garage doors are an alternative for applications requiring economy and reliability in a lighter gauge commercial door. A Great start to long lasting door solutions. . . . Climate control. Reliability. Durability. Our premier polyurethane insulated steel commercial garage doors have it all, providing excellent temperature control, energy efficiency and long lasting service for a wide range of applications, such as firehouses, warehouses, and municipal buildings. These high quality, polystyrene insulated steel garage doors provide energy efficiency and long service under demanding conditions. Ideal for use in municipal buildings, warehouses and shipping dock applications, or where value and energy efficiency is needed. Premium-duty 20 gauge and heavy-duty 24 gauge steel insulated garage doors are for most commercial and industrial applications. 25 gauge insulated steel doors are an alternative for applications requiring economy and reliability in a lighter gauge commercial garage door. A Great start to long lasting garage door solutions. . . . Please note that Wayne-Dalton manufactures a full line of sectional overhead doors, including insulated steel panel doors, uninsulated steel panel doors, glazed aluminum doors, and wood panel doors. Most are available with vision panels or windows. Thermospan® 200 & 200-20 is a total insulating system, including thermal barrier and joint seals as well as vinyl top seal and bottom astragal-all attached to the door sections. All seals are factory-installed to save installation time and avoid the problems sometimes found on conventional doors due to inadvertent exclusion of seals during installation. Chemical bonding of CFC free polyurethane to steel skins creates a unitized body with superior strength, insulation and dent-resistant characteristics. High quality materials are provided with the doors such as hardware plates at all fastener points for added durability and life, hot dipped galvanized steel end caps protect the end of the door and help provide a tight seal against the jambs and graduated hinges and inclined adjustable track assure a snug seal against air infiltration. Thermospan® 200 and 200-20 are virtually maintenance free. They are impact-resistant and feature a pre-painted exterior surface. The interior and exterior skins are hot-dipped, galvanized, structural quality steel is factory finished with baked-on corrosion-resistant primer and white polyester finish coat (brown exterior is available on Thermospan® 200 model). The Thermospan® comes with factory installed 1/2″ sealed insulated glass windows mounted in a molded high-impact frame. Sections are warranted for TEN (10) YEARS against cracking, splitting, or deterioration due to rust-through, and SEVEN (7) YEARS against separation/degradation of foam insulation. TEN (10) YEARS on insulation value. Thermospan® 150 gives you competitively priced, thermally efficient doors with remarkable insulation values surpassed only by our Thermospan® 200 Model. When you combine this outstanding energy efficiency with an attractive white or brown flush exterior surface, high-strength steel and quiet, smooth operation, you will be glad you chose Thermospan® 150. Standard sizes available up to 26′ wide and 20′ high. Insulation materials placed between two metal surfaces without a thermal break greatly reduce the effectiveness of the insulation. Generally, the outer surface of conventional steel doors wraps around and becomes a part of the inner door surface. The process used to make Thermospan®150 is different. It begins with two separate skins: one for the inner and another for outer surfaces. These skins are separated along each edge of each section by a thermoplastic material that effectively breaks any contact between inner and outer skins. To assure thermal integrity, seals between all section joints are factory-installed, as are vinyl “bulb” astragals which prevent air infiltration between floor and bottom of doors. Because of these features, an excellent “U”-value of 0.0706 is achieved. Testing on a conventional insulated steel door resulted in a “U”-value of only 0.233. Two integral (1-3/4″ deep) struts are roll-formed into the back skin (inside surface) of each section of Thermospan® 150. This often eliminates the need for externally fixed stiffeners which are often used on the inside of conventional doors. And when Thermospan® 150’s cavity is filled with polyurethane, the struts are filled as well, making for an extremely strong, yet lighter weight door. A Thermospan® 150 door is virtually maintenance-free. If damage occurs – or if other than routine maintenance is required – inside face hardware, tracks and springs are standard parts used industry-wide. This means they’re readily available and generally are stocked by most independent commercial/industrial door distributors. Also, with Thermospan® 150, heavy-duty, hot-dipped galvanized hinges and tracks are standard. Both the interior and exterior skins of hot-dipped galvanized steel are factory finished with baked on primer and polyester finish coats. Thanks to the thermal break and joint seal, the inside surface of the door remains close to room temperature, eliminates condensation (and/or frost) which may lead to corrosion of inside face hardware. Sections are warranted for TEN (10) YEARS against cracking, splitting, or deterioration due to rust-through, and SEVEN (7) YEARS against separation/degradation of foam insulation. Thermospan® 125 is a cost-effective alternative to our Thermospan® 200 and Thermospan® 150 models. The thermal efficiency, durability and design of the Thermospan® 125 make it the door of choice when a low-cost, high quality door is desired! The polyurethane core is surrounded by hot-dipped galvanized steel skins providing insulating efficiency. The Thermospan 125 has a R-value of 10.79. A bulb-shaped vinyl astragal provides added protection against air and water infiltration. The Thermospan® 125 is manufactured with high quality materials including heavy-duty, hot dipped galvanized hinges and track. In addition, 18 gauge hot-dipped galvanized steel end caps offer interior hinge attachment surface and exterior leg for proper seal against the jamb. Windows can be specified for the Thermospan® 125 doors. The glass is set in molded high-impact resistant polymer frames. The pin stripes (grooves) and pebble finish on the outer skin not only add strength but also enhance the appearance of the door. Wayne-Dalton offers specifications and full technical support for our commercial products. For further information please visit our product solution center. Sections are warranted for TEN (10) YEARS against cracking, splitting, or deterioration due to rust-through, and SEVEN (7) YEARS against separation of polyurethane from the steel skin of the panel. Clopay has taken the garage door from functional to fashionable. With over 1,000 different designs, in wood, steel, composite, wrought iron and glass, you’re sure to find the perfect style to transform your garage… and your home. The Portfolio™ Line offers many unique designs and materials to enhance your home’s curb appeal. Choose either wood, steel or composite carriage house style garage doors from our Reserve, Coachman, Grand Harbor. The Gallery™ Collection offers grooved steel vintage designs at a more affordable price. For a contemporary look, choose from the Avante™ Collection which combines durable aluminum and glass in sleek modern designs. The popular Classic™ Line of steel raised and flush panel garage doors will complement most home styles. Add one of many decorative window choices to create a custom look. Windsor Republic offers 6 panel designs so you can choose the look that is right for your home. From the timeless raised panel design to the elegant steel carriage design, all Windsor Republic panel designs are deeply embossed into the steel for maximum curb appeal. Download pdf for panel and color information. A Wayne-Dalton Model 9600 Garage Door offers the most options at affordable prices, adding style and curb appeal to your home. Chosen by homeowners for their insulating value, durability, gracious looks, and safety design, Model 9600 doors are backed by a Lifetime Limited warranty for many years of worry-free dependability. Besides offering our own aluminum grilles manufactured by R&S Manufacturing, Inc. we can supply, install and maintain a full range of industry leading grille manufacturers including Dynamic Closures, Inc. and Accordian Doors, Inc.
Breathe easy with AEROFLEX micro perforated steel panels. This model combines the transparency of glass with the strength of steel for good-looking protection. Polycarbonate panels provide remarkable impact-resistance in a surprisingly light package. The panels are 1.6 mm (1/16″) thick and have no horizontal joints. Total protection from prying eyes! With its full-height aluminum panels, this model is totally opaque. Ideal for banks, automatic teller machines, warehouses, reception rooms, etc. This attractive, open style model stands out for its ruggedness. It can be used in many settings including schools, food fairs, stadiums, hospitals, warehouses, etc. R&S offers high-speed and high-performance doors for industrial, commercial, pharmaceutical and cold-storage environments from industry leaders Rytec and TNR Doors. maintains constant climate control while helping to minimize infiltration of airborne pathogens. The Industry’s Most Popular High-Speed, Break-Away™ Door. A Product of the Year award-winner, the PredaDoor® rolling door is the most popular high-speed door in the country. That’s because its simple, direct drive operation and supreme reliability have enabled it to be applied successfully in a vast array of applications. And today, the addition of the System 3® controller, with its integrated variable speed AC Drive system for soft acceleration and braking, makes it more dependable and durable than ever. Plus, the PredaDoor® offers the added safety and versatility of full-width replaceable window panels or optional screen panels. For general applications, it’s the best value in the business. Opens at up to 50 inches per second for improved traffic flow. bottom bar and two electric photo eyes. Only 6-1/4 inches of side clearance and 3-3/4 inches of side column projection required. Fits virtually anywhere. Integral panel connecting ribs provide resistance to wind and negative pressure. Also allows for quick, inexpensive replacement of all panel sections. Optional rigid, 2-ply or 3-ply Rilon™ available for high wind exterior applications. Tight spaces call for The Turbo-Seal Door. Where traffic patterns near doorways are tight and high speed is critical, the Turbo-Seal® ultra high-speed door is your best solution. Opens at up to 100 inches per second. Dual electric photo eyes and pneumatic, dual-chamber reversing edge in bottom bar are standard. Optional, replaceable windows for visibility. Quick-Set,™ Break-Away™ tabs allow bottom bar to be reset without tools in just seconds,virtually eliminating door downtime. Dual guided counterweights help ensure smooth, maintenance-free operation. Modular construction and pre-wiring allow for quick installation. Examples of Applications: Manufacturing Process and Maintenance Buildings in: mining, petroleum, military, agriculture, pulp & paper and steel. This light-weight high-speed roll-up door is suitable for many applications such as environmental separation, distribution centers and manufacturing facilities to name a few. Its compact size (both in terms of height and width), enables trouble-free installation even when there are space restrictions. Curtain material is available in standard blue, orange, red and clear PVC. It has a wide range of safety features such as failsafe reversing edge, counterbalanced emergency access/egress mechanism (available on both sides of door), Nema-4 external electronic control panel and two (2) guide mounted photocells as reversing devices. We carry fire rated vision panels for both metal and wood doors by TGP. See their site. 400 interlock 14 or 16 ga.
2600 slip-on Drywall 16 ga.
4400 Double Egress 14/16 ga. Please Note: Hollow Metal Window Systems of any size can be fabricated. These doors are the most popular in the food service industry. Restaurant owners, architects and specification writers choose this series for its durability and beauty. Select from an unlimited number of decorative laminates to achieve the perfect look for your application. For use in restaurants, hospitals, sports bars and more. Wood Door Specialties offers an inventory of architectural and commercial, plain sliced red oak and rotary natural birch in sizes of 6’8″, 7’0″, 8’0″ and 9’0″. Wood face veneer is available along with plastic laminate. Several standard colors as well as custom matching services are also offered. We also custom make doors to match any hinge layout. Please Note: push button activators are included and standard. R&S provides and installs restroom Don Jo signage as well as accessories from Brobrick and ASI including paper towel dispensers, toilet paper holders, hand dryers, tampon dispensers, waste receptacles, baby changing tables and mirrors. R&S can design and build custom gates for unique environmental restrictions and aesthetic needs.This gate includes panic hardware and lock sets provided and installed by R&S. Custom Trash Enclosures are also available. Please call for further details. The versatility, durability and affordability of Chainlink fencing makes it the #1 choice for homeowners and builders alike. R&S is proud to offer SCS Chainlink products. SCS is a leading high quality chainlink manufacturer. With new colors and improved quality the appearance of chainlink fences has improved dramatically in recent years. Colored posts matching the color coated wire can blend with your landscape or add contrasting beauty. SCS manufactures the best quality slatted fencing in the market today which is sold under the brand names Viewguard® and Viewguardplus®. Viewguard® features plastic slats woven into galvanized or custom color coated chainlink fencing. Viewguardplus®achieves a higher degree of privacy by including a fin on each side of the slat. Products are woven with components from leading manufacturers in their respected fields. Viewguard® and Viewguardplus® are made with high-density polyethylene slats manufactured for SCS. Each slat is inserted vertically into the chain link fencing and secured with a stainless steel staple to ensure stability and strength. Slats are resistant to weather, chemicals, salt and petroleum products. The natural clean finish can be restored easily by one quick rinse from a garden hose.SCS chainlink fence wire is galvanized with a minimum of 1.2 oz. of zinc per square foot – a SCS standard of quality that offers superior protection against corrosion and rusting. Fusion-adhered PVC coated wire is available in various colors by special order.Availability of heights and colors vary. Please contact us. R&S offers wood fencing products from SCS. Western Red Cedar boards and rails are available as well as split rail fencing. Pressure treated posts and support rails are also offered. Cedar boards are available in 1 x 4, 1x 6, 2 x 4 and 2 x 6. Pressure treated products are come in in 2 x 4, 4 x 4, 4 x 6, 6 x 6 and 8 x 8. Please call for other sizes. SCS offers a wide variety of wood fence hardware for residential and commercial applications in both galvanized and black. Please call for details. Hollow Metal Doors and Door Frames are an industry standard in commercial, industrial and institutional construction projects. Metal pass doors combine durability with economy providing a reliable and long lasting solution. R&S is a UL Label Shop providing products in the following categories by industry leaders such as SpecialLite, Mesker Door and Republic Door. Please note: anything not in stock can be ordered with most hardware delivered within 2-3 days. Standard lead time on orders is 5-7 business days* unless otherwise specified. We are a UL Label Shop and custom is our specialty. * Custom orders may require a longer lead time depending on materials and quantity ordered. R&S is a UL Certified Shop offering custom in-house doors and frames as well as hollow metal doors from both Mesker Door and Republic Door. Mesker products meet or exceed all Steel Door Institute (SDI) and Architectural Design Specifications. Mesker is approved for fire rated labeling with UL, WHI and FM. Please Note: SpecialLite doors and frames are offered under our Store Front section. Our In-house team can work with you to construct custom pass doors of just about any size or configuration. R&S offers metal pass doors by Mesker Door. We are confident in offering these products to our customers because Mesker’s commitment to quality is evident in all Mesker product lines including commercial, industrial and institutional metal doors and frames. Each product meets or exceeds all Steel Door Institute (SDI) and Architectural Design Specifications. The door line consists of the standard N Series (non handed door) , Six-Panel , Steel Stiffened,Wood grain , 14 Gauge and Bullet Resistant. The combined durability and economy of these doors make them an outstanding choice for all of your hollow metal needs. UNIVERSAL HANDING: N Series Doors fit both right and left hand openings, due to the double hole pattern and reversible filler plate. Republic offers a complete line of standard and specialty hollow metal doors to fit your architectural needs. Republic doors are available in 20, 18, 16, & 14 gauge cold rolled and galvanized steel. All doors come with a ¾” cell honeycomb core as standard, providing every door with a smoother, flatter, and stronger door. Republic honeycomb doors are available in a complete range of fire ratings (20 minute up to 3 hours) and are certified under both Underwriters Laboratories and Warnock Hersey/ITS. All doors are manufactured from stretcher level quality steel and are thoroughly cleaned and phosphatized inside and out offering excellent corrosion resistance and paint adhesion. Republic’s DM series doors are available in 18 or 20 gauge cold rolled steel or galvanized (A60) steel. Republic´s “McKenzie Edge” lock edge is continuously lap seam welded and planished, providing a near seamless appearance – SDI levels 1 and 2 – Physical performance level A.
Republic’s DL series doors are available in 16, 18, and 20 gauge cold rolled steel or galvanized (A60) steel. Face sheets are continuously projection welded to hinge and lock channels on 5” centers. SDI Levels 2 and 3 – Physical performance level A.
Republic’s DE series doors are available in 14, 16, 18, and 20 gauge cold rolled steel or galvanized (A60) steel. Face sheets are continuously projection welded to hinge and lock channels on 5” centers. SDI Levels 1, 2, 3 and 4 – Physical performance level A, B, C, D.